Non-alcoholic fatty liver disease (NAFLD) is one of the most common diseases worldwide, affecting more than 30% of general population. 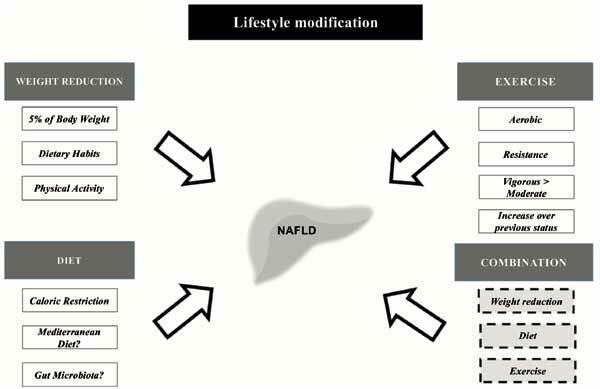 High-fat diets, physical inactivity and obesity, all prevalent in the western societies, are strongly associated with the development and progression of NAFLD. Current drug therapies have not consistently shown substantial beneficial effects. Thus, lifestyle modification appears to be the optimal intervention in combating the disease. Accordingly, several studies have concluded that weight loss, via increase in physical activity, and dietary interventions could potential ameliorate biochemical, histological, and structural abnormalities of non-alcoholic fatty liver disease. The aim of this review is to summarize the findings of these lifestyle intervention studies and discuss the implementation of each intervention, and its effectiveness in the management of the disease in everyday clinical practice. Keywords: Non-alcoholic fatty liver disease, non-alcoholic steatohepatitis, lifestyle modification, weight loss, physical activity, nutrition, diet. Keywords:Non-alcoholic fatty liver disease, non-alcoholic steatohepatitis, lifestyle modification, weight loss, physical activity, nutrition, diet. Abstract:Non-alcoholic fatty liver disease (NAFLD) is one of the most common diseases worldwide, affecting more than 30% of general population. High-fat diets, physical inactivity and obesity, all prevalent in the western societies, are strongly associated with the development and progression of NAFLD. Current drug therapies have not consistently shown substantial beneficial effects. Thus, lifestyle modification appears to be the optimal intervention in combating the disease. Accordingly, several studies have concluded that weight loss, via increase in physical activity, and dietary interventions could potential ameliorate biochemical, histological, and structural abnormalities of non-alcoholic fatty liver disease. The aim of this review is to summarize the findings of these lifestyle intervention studies and discuss the implementation of each intervention, and its effectiveness in the management of the disease in everyday clinical practice.